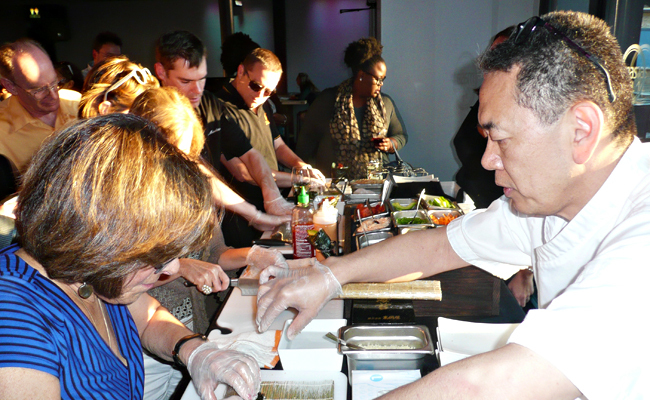 Class Is In Session with Masa 14 – Sushi School Sunday | Exploring Food & Drink in D.C.
Kaz Okochi during Masa 14's "Sunday Sushi School". 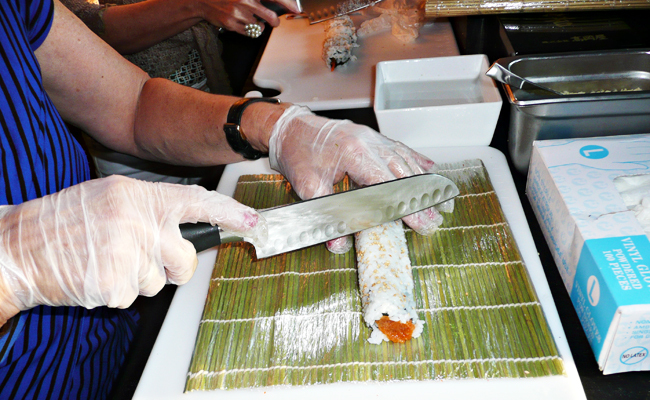 Salmon inside-out roll during Masa 14's "Sunday Sushi School". 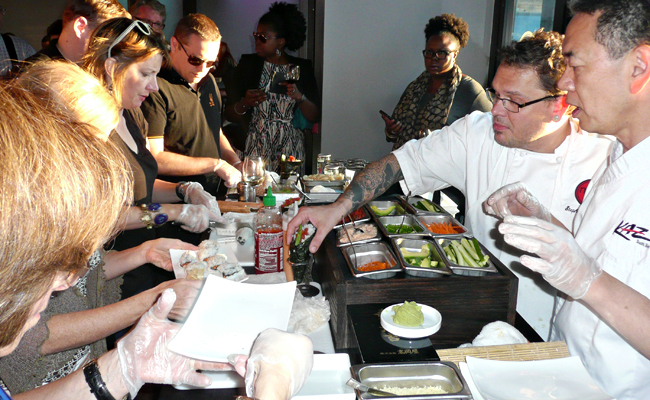 Last night I popped in on Masa 14 to preview their “Sunday Sushi School” pop-up. Class will commence on the first Sunday evening of each month from 6pm-9pm on the rooftop, led by award-winning sushi chef Kaz Okochi. 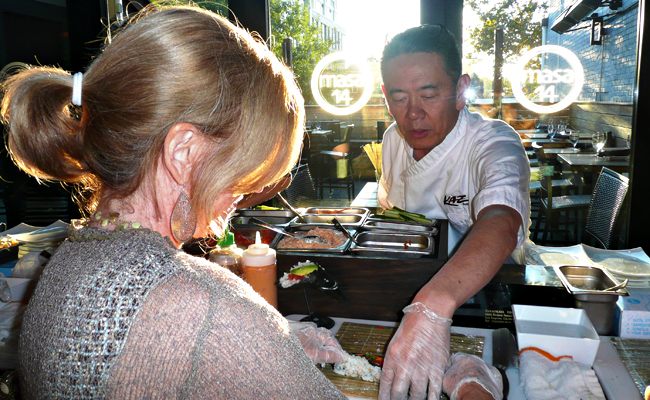 With the assistance of the Masa 14 culinary team, Okochi taught us how to create rolls, such as the Tamaki, using either crunchy shrimp or spicy tuna. We also constructed Inside-Out rolls featuring salmon or spicy salmon. To add to the flavor of our creation, a variety of sauces along with vegetables such as avocados, cucumbers, and scallions were provided. Vegetarian lovers, don’t feel left out. There is a sushi option available for you as well. While school was in session, guests were free to sip on Masa 14’s signature cocktails, such as the Strawberry Lemonade which combines vodka, strawberry puree, agave nectar, with lemon and is Masa 14’s most popular cocktail. Sake-lovers also have the opportunity to pair their hand-made rolls with a 6.8 ounce Nihonsakari Extra Day Cup Sake. All in all, it was a pleasure to have this hands-on experience and participate in Okochi’s “free-style Japanese cuisine”. When class wrapped, we were free to enjoy our personalized creations in Masa 14’s dining room. Okochi is well-known for being on the “cutting edge,” and I would recommend Sushi School Sunday to anyone seeking a hands-on creative cuisine experience with an award winning chef. Guests have the opportunity to participate in this unique experience for $15 per person for two rolls each, or $21 per person with the Nihonsakari sake pairing. Tags: Kaz Okochi, Masa 14, Sunday Sushi School, Sushi, washington dc. Bookmark the permalink.